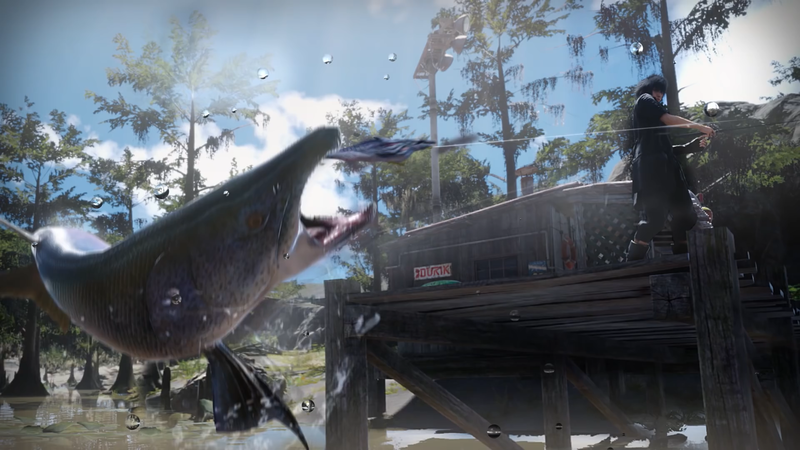 Fishing is a Skill in Final Fantasy XV. Noctis is the fisherman of the group and engaging in this activity at fishing spots is a way to increase AP as well as catch fish that can be used as Ingredients for Meals and in Crafting. As you upgrade the fishing skill, it will yield better results when you fish in the form of more AP, more valuable fish, and increased chances of keeping your catch. The rarer the fish, the better the ingredient or treasure it provides. By homing Noctis's fishing skills and acquiring new tackle, you can reel in real whoppers and reap the rewards. Some fish are edible, while others are prized. 2 Lines wear down 25% slower when fish struggle. 3 Fishing shops offer 10% discount on all items. 6 Fishing shops offer 30% discount on all items. 7 Lines wear down 50% slower when fish struggle. 9 Fishing shops offer 50% discount on all items. 10 Ability to catch fish up to 59 Inches. The line should be reeled when controller is not vibrating.